Eliminates writer's block with automatic content generation and 5,000+ sentence prompts. 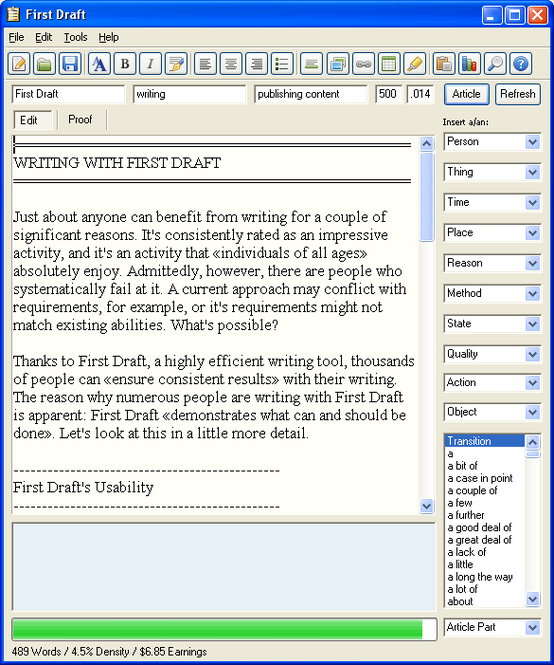 This software is appropriate for online freelance writers, content providers, bloggers, and more. Eliminates writer's block with automatic content generation, 5,000+ sentence prompts, and over 15,000 common phrases. This software is appropriate for online freelance writers, content providers, bloggers, and everyone else who struggles with writer's block. Features include keyword support, template editing, an automated spelling and grammar corrector, a word requirements - pricing - and earnings meter and more.